Tyrone HS will be the host for the 2019 TIA Allegheny Mountain Region 11 Championships on Saturday, April 27. Over 30 units from throughout the Alleghenies will compete in contests held for percussion, twirling, dance, and color guard. In addition to the weekly Sheetz Performer of the Week Award, the TIA-11 scholarship will be awarded and the team sportsmanship award will be presented. Plan to be at Tyrone HS to cheer on the TIA-11 units in their final local performance of the season! Click here for GPS address, participants, and show schedule. ​Click here for full schedule. Registration is now open for members of Tournament to become a member of the 2019 Tournament of Bands All-Star Marching Band. The TOB ASMB will participate again in the Philadelphia Thanksgiving Day Parade. All sections are open, and some are already nearing capacity, so don't delay if you'd like to participate in a band of nearly 200 members and be seen live on national television marching through the streets of Philadelphia. Additionally, our members are often part of the closing ceremonies on the steps of the museum when Santa officially arrives! This year's registration fee is only $75 per student. Registration information is available at www.njatob.org -- see home page. You can join several other TOB-11 and TIA-11 members who have already registered for the 2019 ASMB. All members of Tournament organizations who will be in grades 9-12 during the 2019-2020 school year are eligible. If your school pays a membership fee for the indoor season, then band members are welcome regardless of whether the band itself is a member. Additionally, members of independent indoor organizations are welcome to participate as long as the organization is a paid member of Tournament. ​Don't miss out on this exciting opportunity! Congratulations to the dozens of TIA units from across Pennsylvania who participated in the Homer-Center HS indoor contest. ​For more contest results including scores and placement by class, click here. Congratulations to all performing units who endured a long day of competition at Johnstown HS on April 6. Congratulations to Chloe Bierley of St. Marys HS Guard for being selected as the Sheetz Performer of the Week Award recipient. Click here for show results including scores and results by class. All seniors are invited to submit an application for the TIA-11 Scholarship! Scholarship applications are due April 5th. This is a $500 scholarship. The application link has been sent to all directors--see your unit director for details! DIRECTORS: Please forward the list of all seniors to Doug Williams, TIA-11 Coordinator, as preparations are being made for the Senior Recognition for Championships. Independent Units may recognize seniors and any member who is aging out. There are many items on a director's check list as we work through the indoor season. Check the list below to make sure you have or will complete each in time! There will, no doubt, be more to add to this list. Stay tuned, and keep up with everything you are requested to do! Congratulations to the 30+ units who competed at the Windber Area High School indoor contest on Saturday, March 23, at the high school gymnasium. Dozens of percussion ensembles, twirlers, dance teams, and color guards entertained the audience during the day-long competition. Congratulations to Lake Soloman (Elk County Catholic HS Guard) for being selected as recipient of the Sheetz Performer of the Week Award. The contest was sponsored by the Windber Boosters. For scores and placement by class, click here. A Showcase for Marching Arts! Tournament of Bands provides a great atmosphere to show off marching bands of all types! TOB provides a venue to perform in front of thousands in a celebration of the marching arts in the Allegheny Mountain Region! Your band can become a member of TOURNAMENT where a minimal membership fee is necessary, but it provides you with access to marching band, indoor, and jazz band contests with no entry fees! Opportunities for competitive and non-competitive marching bands, scholastic and independent dancers, twirlers, drummers, and color guards are plentiful! Member schools can have their students participate in the TOB All-Star Band which performs annually in the Philadelphia Thanksgiving Parade! Graduating seniors are eligible for $35,000 in scholarships during marching band season and can apply for scholarships totaling the same amount during the indoor season! Directors, staff, and performers are provided educational and training opportunities via live events and in an online library for directors! Don't miss out on a great opportunity to promote music and performing arts in your school and community! Visit the TOURNAMENT booth at the PMEA conference and sign up for a FREE MEMBERSHIP for the 2019-2020 season! One entry will be drawn for this free membership during the Friday (April 5) afternoon session. For more information, contact Doug Williams, Allegheny Mountain Region 11 Coordinator. Learn all about TOURNAMENT at www.njatob.org. The Glendale HS Twirlers and Jazz Band were hosts for two contests on Saturday, March 16, at the high school in Flinton, PA. The jazz contest filled the auditorium with outstanding musical performances by the jazz bands from Bald Eagle Area, Westmont-Hilltop, and Glendale. Jaden Tornature (Glendale HS) was selected as the Sheetz Performer of the Week Award recipient. There were only a few seats empty for the performances and all in attendance were delighted with the great music! Following the jazz contest, the indoor contest featured 28 units from throughout the west-central Pennsylvania area. Katelyn Pittsley (Kidnetix Twirlers) was selected as the Sheetz Performer of the Week Award recipient. Standing room only is the best way to describe the gymnasium through most of the contest. Thanks to Kelsey Troxell, Glendale HS Indoor Director, for hosting another great contest at Glendale. Click here for jazz results. Click here for indoor results and placement by class. 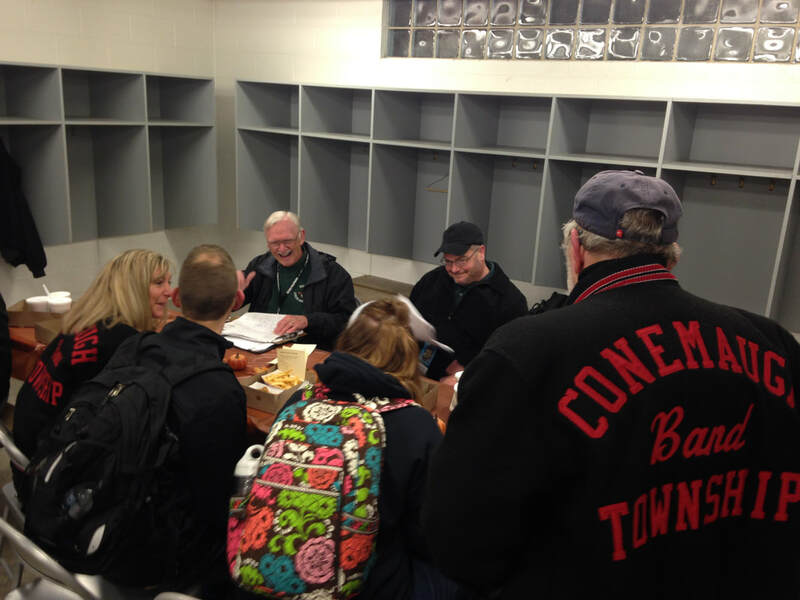 The Westmont-Hilltop HS Band Boosters hosted the March 9 TIA-11 contest. There were 26 competing units from throughout the region in twirling, dance, percussion, and color guard divisions. Congratulations to all performers for their outstanding performances. Congratulations to Savannah Gibson (Dancer's Haven Dance Team) for being selected as the Sheetz Performer of the Week Award winner. For a complete listing of scores and results by class, click here. Congratulations to all performers who participated in the Huntingdon HS TIA-11 indoor contest on Saturday, March 2, at the Huntingdon HS Gymnasium. Twenty groups competed in the event, sponsored by the Huntingdon boosters. Congratulations to Rylie Ellis (Star-Lite Twirlers) who was chosen as the Sheetz Performer of the Week Award winner. ​Click here for scores and placement by class. 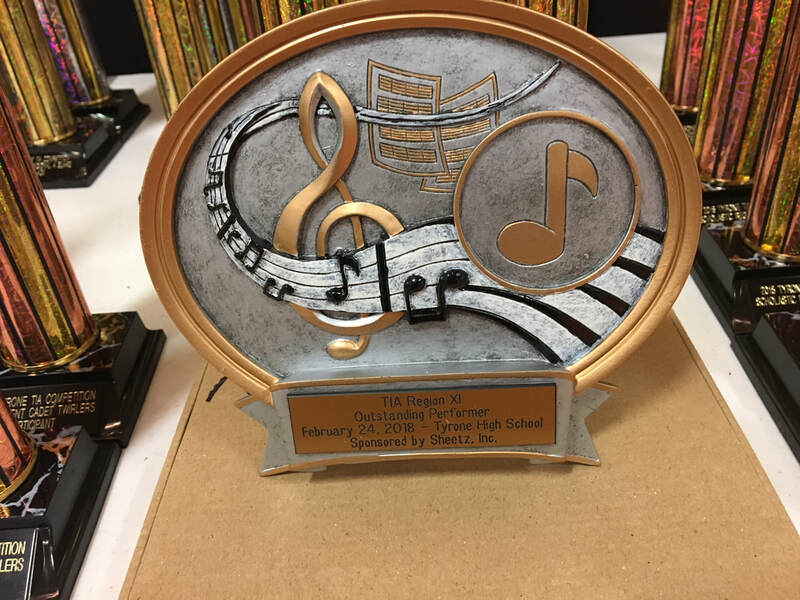 Tyrone HS hosted a TIA-11 contest on Saturday, February 23. Thanks to the Tyrone HS band, indoor percussion, and staff/boosters for hosting another great show! The morning and afternoon hours were filled with great performances from dozens of competing units who demonstrated their skills in percussion, twirling, color guard, and dance competition. Congratulations to Isabelle Parks (Juniata Valley HS Guard) who was chosen as the Sheetz Performer of the Week Award winner! The Critique belongs to the director and staff. Here a few reminders to help you get the most out of YOUR critique. We want to help you and your members achieve their potential. Although coming to Critique is optional, it has proven to be extremely beneficial to all the groups at any level of development. Don’t stay away because the show is still rough or incomplete. That is perhaps when we can help the most. Make sure you listen to the commentaries from judges before Critique. Share with the judge what your program is all about and what the creative intent is. e.g. What is the program trying to convey? Ask questions about how the program is perceived from the audience/judges. What you conceived may be excellent but it may not be “coming across” to the judges. e.g. Does this section work? What is needed to make it more effective? Ask questions if you are unsure of what a judge meant in his/her commentary. Otherwise, there is not really a need to rehash what the judge said. e.g. What did you mean by…? Critique time is very short by necessity. Be prepared with your comments and questions to make the most of your time. MASCOT MANIA 2019: Be a Part of the Newest Wildwood Tradition! ​The 2019 Tournament Indoor Association Atlantic Coast Championships will be here before we know it! Last year's events provided so many great performances and memories throughout the weekend, which included Mascot Mania. Each school and organization is invited to bring the mascot along to the shore for some fun events such a boardwalk venture, dancing, miscellaneous games, and leading the cadets and juniors on to the floor at awards. Don't miss out on this year's fun! Again this year, there will be an online contest to vote for your favorite mascot and the winner will be identified along with a donation made to a local charity in the south Jersey area. The 2018 winner was the Dutchman from St. Marys HS! The Viking from Glendale and the Johnstown Trojan also visited the Shore for some fun! For more information, contact your region coordinator or visit www.njatob.org. ​Bedford HS hosted the 2019 TIA-11 Preview Contest and Evaluation Day on February 2 in the high school gymnasium. Over 20 units competed in various classes following a full day of evaluation sessions, clinics, and rehearsal. A near capacity crowd was on hand to cheer on the twirlers, dancers, and color guard performers. Congratulations to Hannah Day (Starlettes Twirlers) who was selected as the Sheetz Performer of the Week Award recipient. Click here for placements and scores by class. ​If you will be a student in grades 9-12 in the fall, and if you perform with a TOB or TIA scholastic or independent member unit, you are eligible to apply for and perform with the 2019 Tournament of Bands All-Star Marching Band in the Philadelphia Thanksgiving Day Parade. Openings in all sections are currently available, but some will fill up fast, so don't delay to apply if you would like to participate! Ask your band director or unit director for more information, or you can visit www.njatob.org for details. Congratulations to All TOB-11 Bands at Atlantic Coast Championships! TOB-11 was well represented at the 46th Annual Tournament of Bands Atlantic Coast Championships! Windber Area HS was named the Group 1 A Class Champion as TOB-11 received its first ever championship banner for the TOB championships! Congratulations to Bob Lane, director, and all staff, performers, and those who participated in the 2018 marching band program. As the championship banner was awarded to the unit captains at the final ceremony, the emotional students indicated that the performance was dedicated to Larry McGiboney, former director of the WAHS band and TOB-11 president. The audiences were also entertained by performances from other TOB-11 bands, including Tyrone, Johnstown, DuBois, Westmont-Hilltop, and Homer-Center. THANK YOU for representing the Allegheny Mountain region! The 2019 TOB-11 schedule will be posted at www.tobxi.com soon! Now is the time to plan your marching band schedule for the 2019 TOB-11 season! TOB-11 welcomes new bands to compete in the A Class or Open Class, or perform in the Festival Class for ratings only. All groups will receive adjudication and review/critique as one of the many membership privileges. As a member of Tournament, there are no fees for regular season contests or the region championship. There is a championship fee for those attending the Atlantic Coast Championships. Check the 2019 season schedule for the Allegheny Mountain Region above and visit www.njatob.org for a complete schedule of all TOB contests. All Tournament members are offered FREE use of technology to register for contests and for ease of communication. Additionally, and perhaps more importantly, unit directors have the opportunity to receive feedback from the judges, at the contest, immediately following the performance, which can be downloaded to your electronic device. No cassette tapes! No cassette recorders! It takes only a few minutes to sit in the gym within eyesight of the router at the technology/tabulator table, connect to the system (you've all received instructions numerous times and they are available at the tech table at each contest) and within a few seconds you can download and then go on your way and listen to the audio files in private as you sit and relax in the cafeteria, hallway, classroom, etc. Some unit directors attend the post-contest critique with notebooks filled with commentary, ready to embark on the next week's changes, fixes, and design processes, and the time spent in critique can then be best utilized discussing fine tuning, refining of the commentary, or even ask judges about some possible changes. Unit directors that attend and say "I didn't listen. So, what did you think?" are wasting a great opportunity when the judges simply have to rehash what they recorded and there is little or no discussion as to how to implement some of the issues already discussed. This opportunity is FREE for all Tournament members. DID YOU KNOW that other associations charge EACH MEMBER UNIT as much as $100 PER SHOW PER UNIT to receive files? DID YOU KNOW that the WINDI system is unique to Tournament, designed for our own use in audio files, scoring, scheduling, etc.? DID YOU KNOW that Tournament has invested heavily to create a near paper-free environment activity yet at the same time provide every bit of information via the use of technology? DID YOU KNOW that units who prepare for post-contest critique typically get more out of the critique, and also tend to show the most improvement? If you have any questions pertaining to WINDI's use in Tournament, downloading files, downloading the most recent app for your electronic device, or any other technological feature, please contact Doug Williams, TIA-11 Region Coordinator, and he will be happy to provide you with details and assistance. The 2019 TIA-11 season will again include presentations for the Performer of the Week! Sheetz, Inc., sponsors the award for each indoor and marching band contest in the Allegheny Mountain Region 11. Congratulations to the 2019 TIA 11 Award Winners! For more information, contact Doug Williams, TIA-11 Coordinator. Tournament Indoor Association Allegheny Mountain Region 11 has set a tentative schedule for the upcoming 2019 season. It'll be another busy indoor season with plenty of opportunities for performers to perfect their skills and broaden their scope of entertainment. The 2019 TIA-11 season will include nine regular season contests and a regional championship, all at familiar sites. Additionally, Glendale will host the annual jazz contest on the day of the GHS indoor contest! The 2019 TIA Atlantic Coast Championships will be held May 2-5 in the Wildwood and Cape May Courthouse region of South Jersey. More details for all TIA events can be found at www.njatob.org. Click here to download the 2019 TIA Standard Announcement Form for Units. Directors should visit www.njatob.org and log in to the WINDI account in order to download the most recent WINDI mobile app for use in downloading adjudication files at contests. This update was made within the last few months and it would be a good idea to remove the old app and download the most recent in order to assure access to files at this week's contest. Be sure that all equipment and props are properly and adequately padded to prevent any damage to the gym floor. All dues and insurance forms (independent groups) must be paid and presented before you are allowed on the floor. If you haven't sent your sound files to Doug Ott, you need to do that. You should always bring backup discs, mp3 files in the event something goes wrong. How Can My Band or Indoor Unit Join TOB/TIA? Tournament of Bands and Tournament Indoor Association provide a competitive arena for marching bands, indoor guards, twirlers, percussion and dance teams, as well as for jazz bands, choral groups and other related units. TOB/TIA contests are held annually in 9 states throughout the mid-Atlantic region where 13 regions are created geographically for local contests. West-central Pennsylvania is designated as the Allegheny Mountain Region 11. From September through October, marching bands will have the opportunity to perform in contests throughout the chapters. The number of musicians (or auxiliary, whichever is highest) is used to determine the group size. Bands can elect to compete in the Open Class (traditional TOB scoring), A Class (new bands or staffs), or Festival Class (Ratings only). Indoor ensembles perform from January through early May. Please view www.njatob.org for guidelines and classifications of color guard, twirlers, dance teams and percussion ensembles. An annual membership fee of $100 entitles ALL of your school or organization units to participate without additional costs for the year! A one-time fee for performance bond is allocated to each unit. If you have any questions or are interested in obtaining more information about joining TOB/TIA, please email Doug Williams, Allegheny Mountain Region 11 Coordinator.